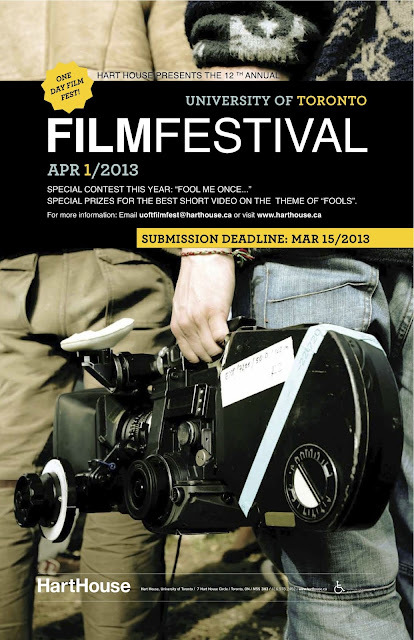 The 12th annual U of T Film Festival is accepting short videos of any length, genre and topic. Film/video installation art also welcome. Installations will be exhibited at our receptions before and after the screening. We will look at everything but priority will be given to submissions from University of Toronto students, staff, alumni & members of Hart House. Special Contest this year: “Fool me Once…” Special prizes for the best short video on the theme of “fools”. Deadline for submission: Mar. 15, 2013. Early submissions encouraged. There are no submission fees. The U of T Film Festival takes place at Hart House on Apr. 1, 2013.